Ultrasonic welding is one of the most widely used processes for bonding polymers, valued for its speed, flexibility, and low cost. In recent years, there has been greater demand from OEMs and processors for more controlled and consistent ultrasonic welding, especially for production of medical devices and high-value precision components. New developments in electric servo-driven welders are helping to meet this challenge. Application testing and customer feedback have shown that electric servo-driven ultrasonic welders can provide significantly more consistent results than standard pneumatic ultrasonic welders. Servo-controlled welding is targeted for production of components and assemblies that require precise dimensional tolerances, such as those in medical, electrical, automotive, robotic, and fluid-control systems. Servo-controlled ultrasonics also facilitate production of parts that require FDA validation, where the process affords repeatability and precise documentation. With servo systems, processors of high-value goods such as medical components have a servo-controlled welding option that brings significant performance benefits over pneumatics. This is a breakthrough development in plastic welding that solves manufacturers’ most pressing challenges: process repeatability, validation, calibration, and manufacturing cost. Ultrasonic welding is the joining of thermoplastics through the use of heat generated from high-frequency mechanical motion. Although it was first developed several decades ago and has been widely used in the plastics industry for a number of years, there have been few fundamental design changes in the process since Dukane’s introduction of “Weld by Distance” in 1988. Ultrasonic welders have long been a popular choice for joining thermoplastics in a broad range of end-use markets, due to several factors. The equipment is compact, easy to incorporate into automation, and economical. Additionally, ultrasonic welders can produce high-quality welds in a short cycle time. 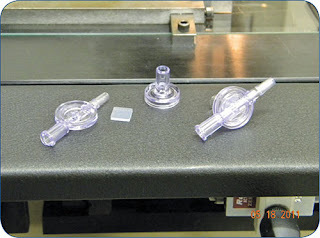 The greatest advantage of ultrasonic welding, however, is the ability to use very precise process control. Servo-controlled ultrasonic welders, like Dukane’s iQ Series with Melt-Match technology, offers numerous advantages over pneumatics, such as much more precise control of weld and hold collapse distances. The welding equipment typically consists of a press, generator, transducer, booster, and horn. The generator converts standard electric line power into high-frequency AC voltage that is then passed through the transducer. The transducer consists of piezoelectric ceramics that expand and contract at the same frequency as the alternating voltage applied to each side of the ceramics. This sinusoidal mechanical vibration is then passed through the booster and horn into the parts to be joined. When force is applied between the parts by the press, these vibrations pass to the weld joint area, where melting occurs. After the vibrations are stopped, the plastic solidifies during the “hold” phase, forming a welded assembly. The basic function of a pneumatic press is to apply force between the parts using an air cylinder. The amount of force is generally controlled using a pressure regulator and one or more valves. Typical process-control parameters available to the user are ultrasound amplitude, weld pressure (constant or profile), weld time, hold pressure (constant or profile), and hold time. More advanced systems also have the ability to measure distance, allowing another level of control of the weld and hold distances. Servo-driven welders such as Dukane’s iQ Series, which was introduced in 2009, is different from pneumatic systems because it utilizes an electrical servo actuator in place of the pneumatic cylinder. Instead of controlling the force, the servo system controls the speed of the horn during the weld and hold phases. Typical servo process-control parameters are ultrasound amplitude, weld distance, weld speed (constant or profile), hold distance, hold speed, and static hold time. The servo-driven welder provides several advantages over pneumatic systems. The main advantage is significantly more precise control of the weld and hold collapse distances, which stems from the underlying method of distance control. In pneumatic systems, the distance is controlled indirectly by relieving pressure from the air cylinder once the desired distance is achieved. Due to the limited rate at which compressed air can escape the cylinder, as well as other factors, the press typically travels beyond the desired collapse distance by varying amounts. Conversely, the servo system controls the distance directly through closed-loop servo position control. The servo dynamically seeks to arrive at the desired position, yielding very precise and repeatable results. Data from an experiment comparing repeatability of distance welding for round polycarbonate filter parts (see Fig. 1) indicate that the standard deviation of the total part collapse was more than 3.5 times smaller for the servo system than a pneumatic system (actual values were 0.00012 in. or 3 μm for the servo vs. 0.00046 in. or 12 μm for pneumatic). The standard deviation of the weld pull strength relative to the average was smaller, as well—2% for servo vs. 4% for pneumatic. system than for a pneumatic system. An example of servo performance in an industrial setting is the welding of the dual check-valve parts shown in Fig. 2 (parts and weld data come from Value Plastics Inc., Fort Collins, Colo.). When programmed to weld by collapse distance of 0.0088 in., the servo system achieved an average collapse of 0.0088 in. (224 μm) with a standard deviation of 0.00008 in. (2 μm) for a 1000-part sample. 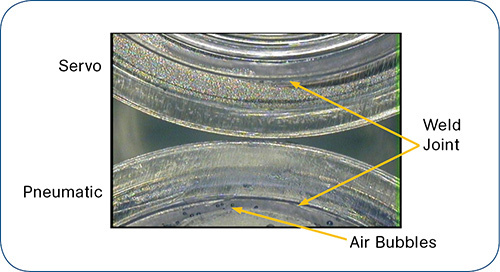 In addition to the highly repeatable weld collapse performance, the quality of the welds obtained on the servo system was better than with a pneumatic welder due to the elimination of air bubbles near the weld zone (Fig. 3). a standard deviation of 0.00008 in. (2 μm) for a 1000-part sample. 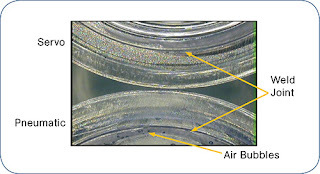 elimination of air bubbles near the weld zone. Another advantage is the ability of the servo press system to change speed rapidly. In certain applications, it is desirable to profile the speed during the weld in order to match the rate of material melting. Since most ultrasonic welds take less than 0.5 sec, it is critical to change speed quickly to achieve meaningful weld profiling. The servo system is capable of accelerations of 50 in./sec2, which is equivalent to changing speed by 1 in./sec in 0.020 sec. The ability to program independent speeds for up to 10 different segments of the weld, along with the servo system’s ability to dynamically sense when melting is initiated at the beginning of the weld process, is what Dukane terms Melt-Match technology. Although some pneumatic systems are capable of varying the force during the weld, the rate of change is restricted by the time required to move air in or out of the air cylinder. Rapid speed changes on the servo welder also afford the flexibility to achieve hold speeds that are substantially different from the weld speeds. Versatility is another key advantage of servo systems. Some applications considered very difficult if not impossible to achieve on a pneumatic welder, have been successfully executed on a servo system. One example is sealing and cutting of thin films, where the weld distances and forces are quite small. With precise distance control, the servo system is capable of achieving quality welds. Enhanced control capability in the hold phase, which consists of a dynamic stage (parts are collapsed further after ultrasound is turned off) and static stage (servo maintains its final position to allow the solidification process to complete). Ease of calibration due to the elimination of pneumatic components. Ease of welder “cloning” due to digital process control (i.e., ability to set up multiple welders to achieve identical performance). Servo-controlled welding systems also provide many cost benefits. Due to the high degree of process repeatability, rejects can be reduced. This enhanced ability to maximize yields is especially important in cases where the assembled parts are of high value. The elimination of compressed air for press actuation can also produce savings. A typical 40-hp compressor can cost approximately $13,000/yr to operate. In addition, the expected maintenance costs are smaller. In typical applications, the servo actuator has a life span in excess of 200 million cycles. To ensure process repeatability and maintain calibration, the servo system is designed without adjustable mechanical operator controls on the machine. This prevents accidental or unauthorized changes in calibration and validation. Another key feature that provides tighter process control is Dukane’s patented iQ series power supply. It boasts industry-leading processing speeds of 0.5 millisec. The system also uses iQ Explorer graphical user-interface software for facilitating process setup and weld-data acquisition. While servo systems are generally more expensive than standard pneumatics without process-control capabilities, they are within the price range of high-end pneumatics with advanced control features. Dukane’s servo-controlled systems have been installed at multiple OEM and processor sites in North America, Europe, and Asia. Paul Golko is senior project engineer at Dukane Corp., St. Charles, IL, where he has worked on the development of servo-driven welding equipment, including the iQ servo ultrasonic welder.